When it was announced that Humberto Leon and Carol Lim would take over the creative reins at Kenzo, there were a few question marks raised but moreover, there was excitement to see what this brainchild duo behind Opening Ceremony and countless clever collaborations could do at a house that had perhaps lost its verve in the past decade. The very fact that the price points of the brand will be coming down to a more accessible contemporary level states Leon and Lim's intention to reposition Kenzo as a fun-for-all house. As we entered the Kenzo offices at rue Vivienne, models waved at us in colourful visors as we stood amongst giant K,E,N,Z,O blocks as though it were a children's TV programme set. The clothes were anything but childs play though even if the onslaught of primary colours, inspired by painted Ellsworth Kelly suggested otherwise. Kelly for Leon and Lim represents the collision of French and American culture, and for their debut collection, American sportswear mixed with Parisian ease and a sense of fun that is wholly international is what makes for a winning combination. Kenzo wouldn't be Kenzo without a print and here illustrated birds and fishnet pattern form Leon and Lim's print posse that would be contrasted with a bevy of functionally fun pieces. With the likes of Jason Schwartzman on the drums, Spike Jonze filming it all and Chloe Sevigny as model, Kenzo will surely find its way into the hearts of a new generation as well as those before that will have much to choose from in this assured debut. Dazed Digital: Where Kenzo has been floral-centric beforehand, it's quite subtle in this debut - was that intentional? Humberto Leon: I don't think the brand needs that heaviness of just pure florals. I think where we wanted to do flowers where appropriate. Florals made of florals, florals made of birds. We wanted to treat florals as icing to the collection. You'll see little tulip shapes in the skirts and flower buttons as hints of flowers. It's not obvious. I didn't think we needed to feel the burden of flowers. DD: How would you sum this new direction for Kenzo? Humbero Leon: The signature is definitely the proportions, introducing sensuality and youthfulness into the collection - it's not youthfulness of age but of the mind so it's accessible to all. It's for people of all ages and body types and we want it to be a welcoming and inviting brand. DD: The price points will be shifted for the brand - what was the decision behind that? Humberto Leon: We wanted to become contemporary but luxury in the sense that it's luxurious to be able buy things from the catwalk. We want the value of the piece to be inherent in every piece, to say that everything is worth it. DD: Do you have any personal memories of Kenzo? Carol Lim: Kenzo was a brand we first discovered when we were shopping for vintage especially when we were in college at Berkeley. I have 30 amazing Kenzo pieces. When you find it, you'd always notice the colour and the detail of what he created. 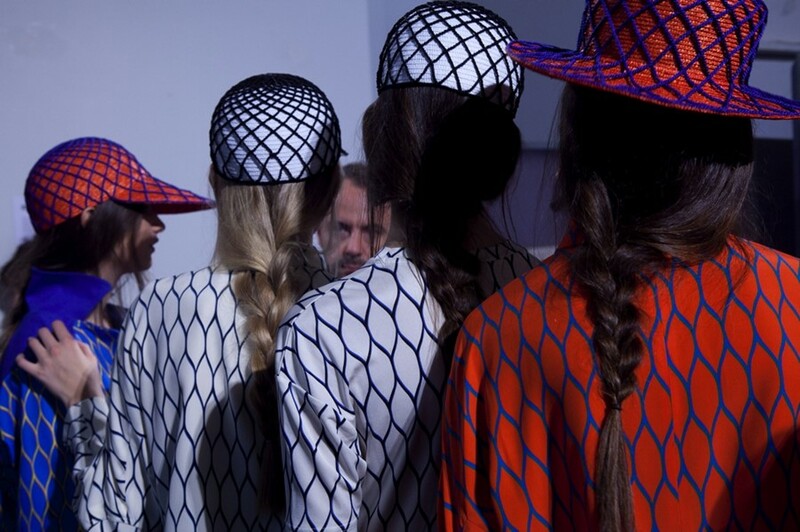 Humberto Leon: Kenzo was so of the moment. In the 70s, he was so 70s. In the 80s, he was so part of the 80s. I think Kenzo in 2012 needs to feel like 'now'. What he would do now if he started this brand.